Kingman Daily Miner – A multi-media company’s family has transformed a long legacy of sharing tennis with their community into a $26,000 gift to Mohave Community College Foundation. The contribution from the Yuma Tennis Association via the Soldwedel family – owners of Western News & Info, Inc. (WNI) – sets up the Daily Miner Scholarship – YTA with perpetual endowment funds that will provide scholarships for MCC students of all ages and countywide for decades to come. The Kingman Daily Miner on behalf of the Soldwedel family presented MCC leaders with a check for $26,000 for scholarships for years to come. 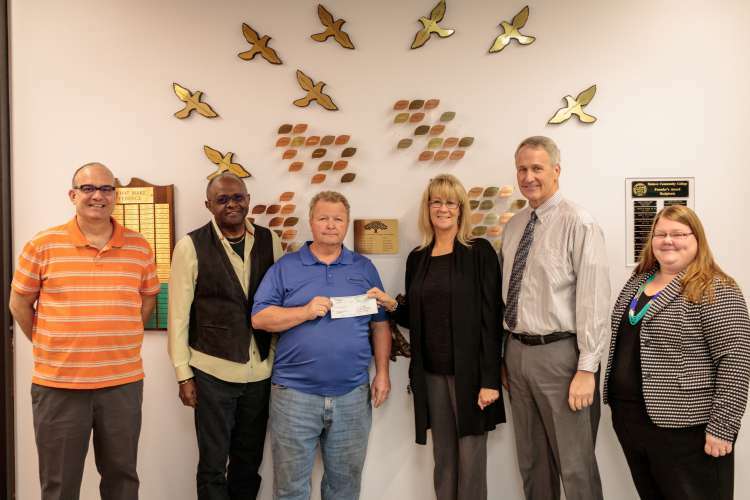 Pictured from left to right: Shawn Byrne, Miner Editor, Dr. Fred Gilbert, Dean, Kingman Campus, Marvin Taylor, MCC Foundation Kingman Chapter President, Debbie White, Miner Publisher, Dr. Michael Kearns, MCC President, Carrie Kelly, MCC Foundation Executive Director.